So happy to be bringing you the first layout in my new collaboration with my fellow design team member Suzanne Johnston. Suzanne and I are doing a collaboration this year where we are working in an art journal for as long as it takes to fill it and then sending each other the finished journal at the end. We are sending each other an envelope full of die-cuts and inspirational items as prompts for layouts. From the prompts, I selected the clippings of musical paper which I reconfigured as houses. 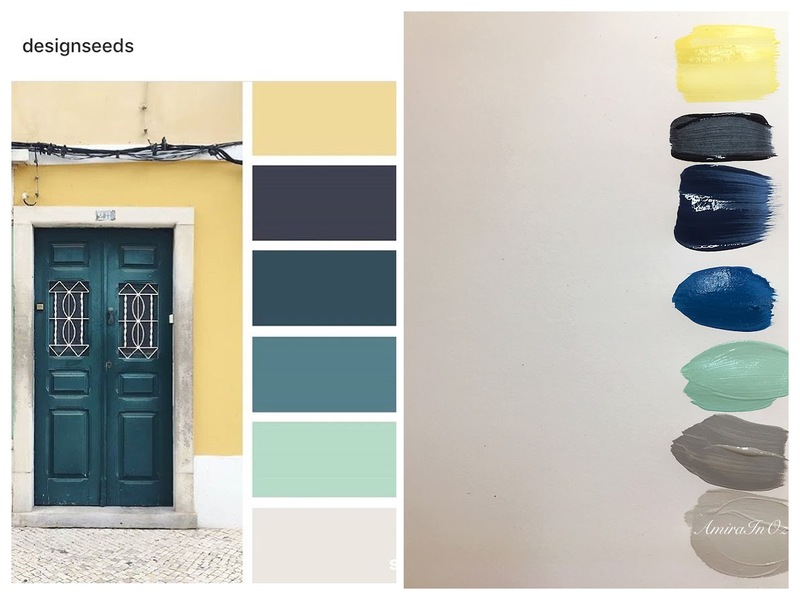 From there, I went onto Design Seeds and picked out this color palette. Next it was time to decide on the colors for the background and this is what I went with. Grey and yellow is my new LOVE! The houses look great against this background. I then added some script stamping and some white impasto through a stencil to give the background more interest. Next it was time to work on those houses. A light coat of color so that you can still see the musical score underneath. I also inked the edges. Now, if there was ever a time to show you how much DOODLING elevates your work, it is here and now. Look how gorgeous these houses turned out. I used a white gel pen and my fine tip sharpie (next time must find my black gel pen). The houses go on and they look great! Next, I select some felt stickers from my stash and make it look like they are coming out of the chimney of one of the houses. Next, I write a quote on a post it note, cut the quote into individual words, ink the edges and then add the words to the layout. I have a process video for you HERE.